The ONLY people who would ever call you about a problem on your computer would be your Internet Service Provider, and if they call saying there is something wrong, hang up and call their main office. 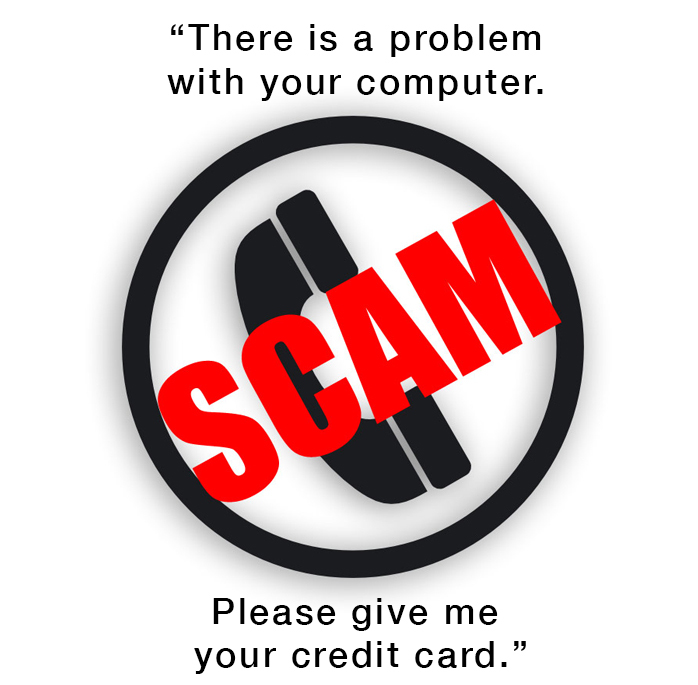 Anyone else calling about your computer is a SCAM. NEVER let anyone you don’t personally know have access remotely to your computer! There are many scams where people are falling victim to ‘fake support’ service. Any security message on your computer that has a phone number is a SCAM – don’t call it! If you are worried about your computer security, give us a call today at Pensacola Computers and ask about our Security tune-up. Recently a virus that has been around since earlier this year, has morphed into a greedier and more prolific version. The current version of this virus was first reported in September of 2013 and is considered to be in the class of Ransomware. What this virus does is it encrypts certain file types on your computer such as pictures, documents etc using a mixture of AES and RSA encryption. Once the virus has encrypted the files, you will not longer be able to access them, and it will display a CryptoLocker payment program which says you must pay $300 USD within 96 hours or the encryption key which will unlock your files will be destroyed making your files for all intents and purposes unrecoverable. Currently there is no one who has been able to crack this encryption, and a brute for attack to decrypt the files would take a super computer years and years. Although some websites have reported that this virus makes your computer completely unusable, that is far from the truth, you can still use your computer, the virus makers need you to be able to use your computer to pay the ransom, you can even easily remove the virus, however at this time, the only known way to recover the files is to pay the ransom (we are not suggesting to do this, as there is still no guarantee that it will get you your files back). The virus is being spread most commonly through email attachments that pretend to be from places like FedEx, DHL, UPS and are often sent to company email addresses. The emails contain a ZIP file that when opened show a file that will often to appear to be a PDF file but is actually a exe file (file names like FORM_12345.pdf.exe with the exe being hidden depending upon your computer settings). In order to see the hidden exe extension in Windows, open Windows Explorer (file manager ie My Computer), and if on Windows XP, Vista, or Windows 7, go to Tools, Folder Options, View and uncheck the box that says “Hide extensions for known file types” – in Windows 8, go to the View tab at the top of Windows Explorer and Check the box that says “File name extensions”. You should never ever run any kind of .EXE file that comes in an email, and you should only open any kind of attachment when you know that the specific person who sent the email was sending you that specific file – when it doubt, call the person/business, or send them an email asking about it BEFORE you open the attachment. This virus is actually fairly easy to remove, however if it is removed by antivirus after the files are encrypted, you will have to manually re-install the virus in order to pay the ransom. The guys over at Bleepingcomputer.com have an excellent guide telling all about the cryptolocker virus as well as removal instructions – https://www.bleepingcomputer.com/virus-removal/cryptolocker-ransomware-information although if the virus morphs, these tools may not work. Pensacola computers has been providing licensed and certified Pensacola computer repair and Pensacola computer service to local businesses and home users since 2003 and focuses exclusively on Microsoft Windows and PC’s.